With the most frightful night of the year just around the corner, Nintendo of Europe has put together a platter of mysterious gifts. Will they be sweet as candy or as welcome as rotten eggs through your letterbox? Time to find out. 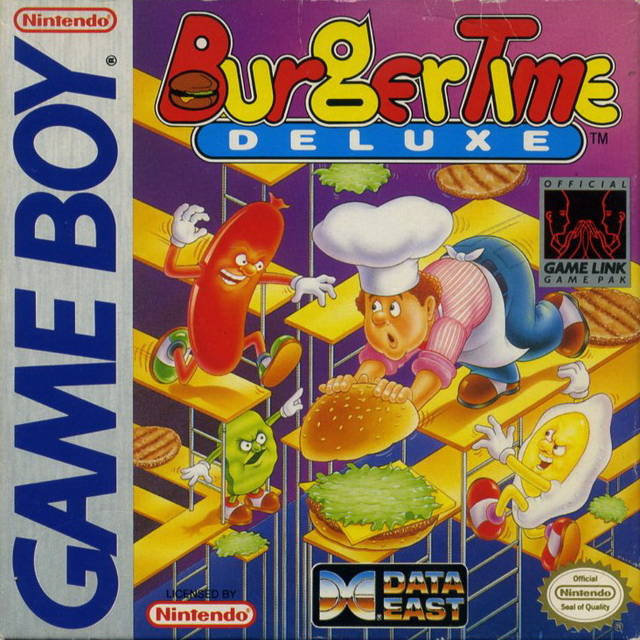 BurgerTime Deluxe (Game Boy, G-mode, £2.70/€3) — No doubt in anticipation of the upcoming BurgerTime World Tour, G-mode keeps the 3DS Virtual Console releases coming with this patty-packing outing. We'll give it the taste test in our upcoming review. Halloween: Trick or Treat (Microvalue, 800pts) — Play as Mike or Sally, go out and trick or treat your neighbours. All the fun of the real deal without any of the inevitable tooth rot. We'll chance our choppers on a review soon. Gabrielle's Ghostly Groove: Monster Mix (Natsume, 500pts) — Step onto the dance floor with the fine — if mortally challenged — folks of Monster Town in this pretty decent groovathon. Check out our Gabrielle's Ghostly Groove: Monster Mix review for more. Kyotokei (Microforum, full price: 500pts) — It's like Ikaruga but with people instead of ships. Now you can try it for free, and don't forget that reading our Kyotokei review is also free. A lot of people forget that. Will you be taking a chance on one of these spooky games this week or playing something else? Let us know. I'll not download BurgerTime Deluxe. I'm happy with Burgertime. Or will be, if NA gets it. Not a bad week. Not a good week. Meh. Will try out Kyotokei. BurgerTime Deluxe is the BurgerTime I spent most time with. I remember it fondly and hope it makes its way to NA soonish. Better then the previous weeks offering. That's for sure! Reading your review is free? LOL! When are we gonna get some Gameboy Color games? And where are the other good GB games? We better get Final Fantasy Adventure. Square Enix have yet to show any interest in the 3DS VC but once they do, we could expect to see their Adventure and Legends games. I'm thinking we'll see regular GBC games once publishers have released all they can from their back catalogue of GB games. For now though every publisher seems happy from releasing mostly their earliest games and moving forward from there, sometimes jumping ahead for one or two releases. I'm interested in the Kyotokei demo. I want to see if it's as brutally hard as Ikaruga. - And nice that we get a WiiWare game that has been america-exclusive so far. Maybe we get a few more soon. - And I'm still hoping for Monster World IV for the VC. Wasn't that already confirmed several months ago? is there any one liking burger time ? i hated this crap younger, and never met anyone who liked that either. @Samholy: I thought Burgertime was pretty good. This one ain't too bad either. Game&Watch Gallery 2 is rated. CUT THE ROPE? NO?! Huh? I'll try to get BurgerTime if it comes to NA. My mom says she used to play it alot on the Atari so I want to try it. In doubt about BugerTime Deluxe and need to see more about Halloween: Trick or Treat. Sounds interesting but I can't find any images of it. Ah, a Kyotokei demo! I'll download it when it's out! It's like the Donkey Kong '94 of Burger Time. I can't wait till NA gets it. The only thing wrong with it is the lack of the NES Burger Time theme song. That's too much Today I was at a game store and saw a very old cartridge for possibly Sega saturn titled "Burger time" and thought what the heck kind of a game that must be. Now I come here and see that the deluxe version is out. @20 - I'd post some up for you if I wasn't on holiday in Spain, that's a game I've been coding for the last few months. @24 - I totally agree about the price, I was shocked. Nintendo set the final prices, we suggested lower. I think they've based it on the fact that it's a 15MB download. I seem to remember that WiiWare was originally priced on download size. There are a total of 45 "scenes". 12 of these are mini-games, the rest Hidden Object scenes. @lalalalalalal - NOA just told me that Cut the Rope will not be coming out till around Christmas..... or was that "Cut the Presents"? @Lapras_King Excellent! Loved the first! Now it's getting cold here in Europe, and it's Spring in Australia, so now is the best time to release Snowpack Park in PAL regions!